Architect: Architectural Resources Group, San Francisco, Calif.
Sheet Metal Contractor: Crown Sheet Metal and Skylights, Brisbane, Calif. When it opened in 1926, the Mark Hopkins Hotel was described as “architecturally perfect and flawless.” The hotel recently received a $10 million exterior restoration that returned the landmark structure to its former state of perfection. Based on many years of experience in historical restorations, Crown Sheet Metal and Skylights was selected to remove and replace all existing architectural sheet metal flashing and ornamental metal work. Dedicating 10,000 man-hours and six months to the almost $1 million project, Crown completed their work on schedule and within budget in April 2003. The portholes and spiral columns were cast to match the original design. All brackets were supported with stainless steel tubes and formed chairs. All work was done off of a cantilevered staging. The Crown Sheet Metal crew was especially challenged by the elevations and environmental conditions while onsite. Their portion of the project was above the 24th floor of the hotel where strong winds were frequently an issue. All finished work was sealed and painted to match historical drawings and was competed prior to staging removal. To replace dormer flashing and ornamental metal work, the crew worked from a fixed staging erected and secured structurally at the 21st floor. After being secured by a double safety line system, workers climbed to the specified location to install hip caps. To complete restoration on the crow’s nest, workers ascended to another staging set inside the crow’s nest that wrapped up and over the exterior wall with a 3-foot wide plank area that did not touch the tile roof system. The upper “Crow’s Nest” roof had considerable decay and lost brackets. The entire wall was reframed and covered with plywood prior installation of copper work. Crown Sheet Metal management requested the Occupational Safety and Health Administration (OSHA) provide inspections to insure worker safety. To their credit, Crown completed this project without a single injury. Working closely with the historical architect, the firm used a combination of 20 oz. copper cornices and cladding to wrap all dormers, valleys, ornamental hip caps and the crow’s nest. A stainless steel support system was engineered to support all of the cast aluminum ornaments. The existing terra cotta ornaments were strengthened as the crew fabricated, installed and soldered 4 pound lead at 24 different deck areas. Crown worked with a local casting company to make certain all the molds matched the original items. Much of the ornamentation required multiple castings that were welded to make the completed part. The aluminum castings were then installed at the various locations. An isolation system was custom designed to prevent electrolysis between the different materials. Material consumption on this project included almost 18,000 pounds of aluminum castings, 10,000 pounds of copper, 5,200 pounds of 4 pound lead, and 1,500 pounds of stainless steel. Crown Sheet Metal and Skylights received the 2004 Guilfoy Memorial Architectural Sheet Metal Award from California-SMACNA for their work. 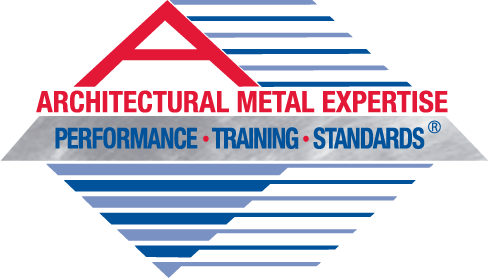 The Guilfoy award is presented annually to the California SMACNA firm whose work best epitomizes high-quality craftsmanship in architectural sheet metal. 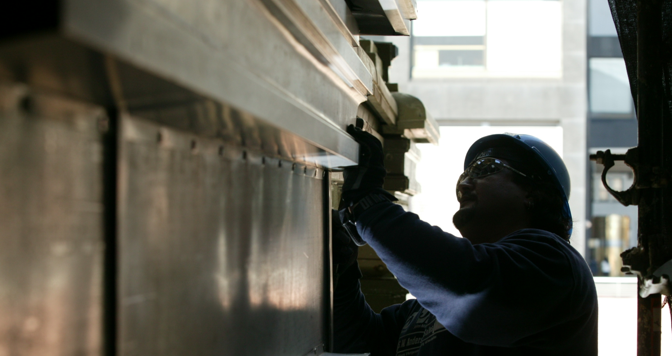 A second SMACNA contractor, Delucchi Sheet Metal Works, in San Francisco, performed work on the lead deck covers at a lower elevation.